The Costa Mesa City Council will meet again on Tuesday, March 1, 2016 beginning at 5:45 in Council Chambers at City Hall. You can read the full agenda HERE. We could be out of there well before 8:00 p.m. Early in the meeting Gordon Bowley will receive the latest iteration of the Mayor's Award. Following Public Comments, Council Member Comments and the report from the Chief Executive Officer, Tom Hatch, the Consent Calendar will be considered. There are eight (8) items listed on the Consent Calendar and, in theory, they are of routine nature and will not be pulled for separate discussion and be handled in one combined vote by the council. However, if one of the council members, a staff member OR a member of the public wishes to pull one of those items for separate discussion, under the rules imposed by Mayor Steve Mensinger, it will be trailed to the very end of the meeting for discussion and vote. I didn't list all the temporary service items, nor the consulting fees for things like Inspection and Plan Check services. It was interesting to note that we apparently spent nearly $40,000 on one entry with Jones & Mayer, our contract City Attorney firm. Anyhow, enjoy. There are no Public Hearings scheduled for Tuesday night. 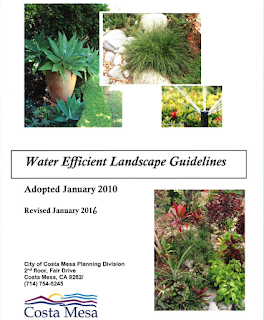 Old Business #1, HERE, is the second reading of a mandatory ordinance related to water efficient landscape plan and related guidelines required by new state rules. This should take five minutes, tops. New Business #1, HERE, is an interesting issue. This is the lease agreement with the Boys and Girls Club of the Harbor Area, inc., and the City for property at 2131 Tustin Avenue. The original lease was for a term of 50 years, with a proviso that the Lessee shall have the option to extend the lease for an additional forty-eight (48) years. This is where we are today. The new term would commence November 14, 2016 and expire November 13, 2064, with a rent rate of $1 per year. 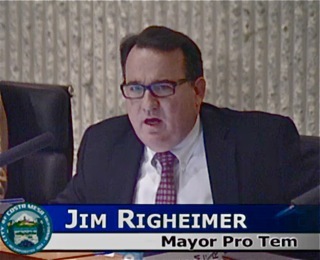 New Business #2, HERE, is the vindictive demand by Mayor Pro Tem Jim Righeimer for the removal of Anna Vrska from the Fairview Park Citizen's Advisory Committee. No reason is required for a volunteer to be removed from a City committee, but this is clearly the result of Ms. Vrska's recent unfortunate use of the word "Nazi" when referring to the Sergeant-at-arms during the Planning Commission meeting on February 22, 2016. Righeimer will likely deny it, but there is NO other reason for this action. I wrote extensively about this in a recent post, HERE, so I won't say more now except that it demonstrates the petulant dictatorial behavior that we've seen by Righeimer ever since he took office five year ago. Ms. Vrska subsequently apologized for her use of that word. I published her apology verbatim in an entry HERE. I won't be surprised if a few residents and others speak to this issue Tuesday night. This meeting could be a short one, but one just never knows how long winded Righeimer might be, which stretches the time out. 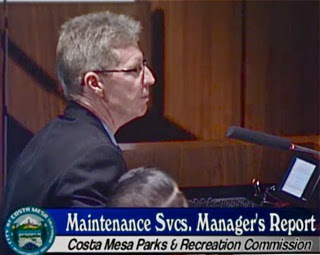 A half-dozen residents attended as the Costa Mesa Parks and Recreation Commission met Thursday evening for what I thought would be a short meeting - it wasn't - and elected Vice Chairman Brett Eckles as the new Chairman and long-time commissioner Bob Graham as Vice Chair. 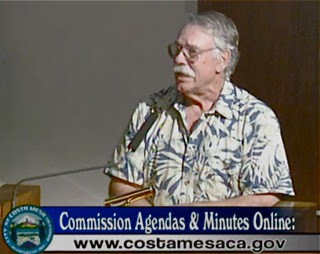 Commissioner Don Harper was absent for the second meeting in the row. During Public Comments both Kim Hendricks and Cindy Black spoke about the latest initiative for which signatures are being circulated. 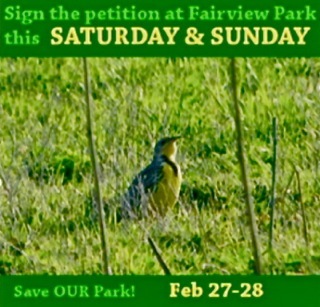 A group called the Fairview Park Preservation Alliance has launched this effort and will be gathering signatures at Fairview Park, and elsewhere, each weekend. Hendricks displayed a new shirt with the logo of the group which apparently can be purchased for $20.00 and Black presented a slide announcing the signature-gathering effort for this weekend. Beth Refakes reminded us again of the Eggstravaganza - the collection of candies, toys and plastic Easter Eggs in which they will be place for the Easter Egg Hunt for the children of our adopted Marine group, the 1/5 at Camp Pendleton. Collections of toys, small, individually-wrapped candies and plastic eggs will continue until March 18 and may be deposited in the footlocker in the City Hall lobby. Those wishing to donate cash instead can email Dan Baker at City Hall, or call him at 714-754-5156. 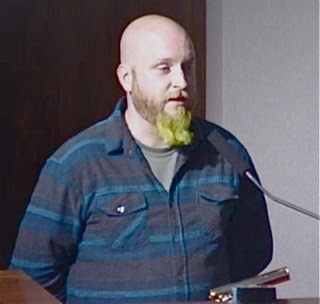 Skateboard enthusiast Rocky Evans once again showed up to plead with the commissioners to find a way to extend the hours at the Volcom Skate Park and also to seriously consider a second skate park for the city. Jay Humphrey congratulated the new officers and thanked the outgoing Chairman Kim Pederson for his leadership this past year. 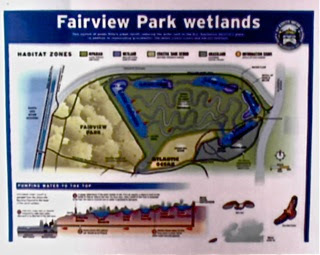 He also referred to the Fairview Park initiative, indicating that the acquisition of Talbert Nature Preserve would NOT be prohibited by the initiative. 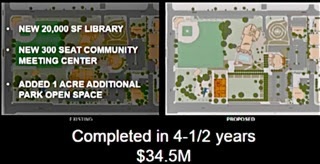 Next up was the presentation by Architect Steve Johnson of Johnson Favaro, the firm working on the project that will replace the existing Neighborhood Community Center at Lions Park with a brand, new two-story library and convert the existing round Donald Dungan Branch Library into a community meeting venue. Johnson showed us several dozen slides demonstrating the various steps and iterations of this project. Presuming all continues as planned, the project will proceed beginning next year and be completed in 2020. The existing NCC will be demolished and the new library building built nearby. Then the rest of the project will commence - including the re-skinning and re-configuration of the old Dungan building and the creation of re-configured parking and new park space. According to the plans, we will loose a couple thousand feet of meeting room space, but their analysis says that won't be a problem if we utilize it better. We were told that every time they do a new library facility the use quadruples. 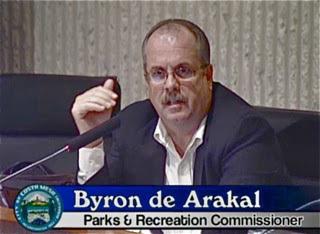 Commissioner Byron de Arakal asked if that growth was sustained beyond the original launch and was told that use tailed off slightly, but not much. de Arakal was concerned that we were only adding one parking space while theoretically increasing the use. 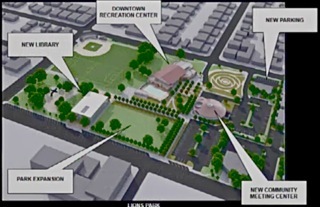 We will pick up an additional acre of park space onsite, plus add one (1) additional parking space. And this little project will only cost us $34.5 million! 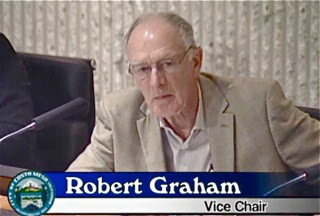 He did not discuss the financial elements of this plan with the commissioners, but apparently did make a presentation to the Finance Advisory Committee and, according to folks who heard that presentation, a few of the committee members were not thrilled with the cost nor the plans. 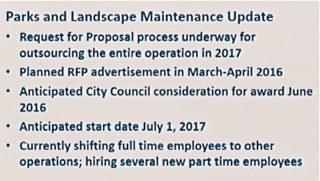 Lucky you, I only included a few of Johnson's slides, but my understanding is that his entire package will be available on the city web site. 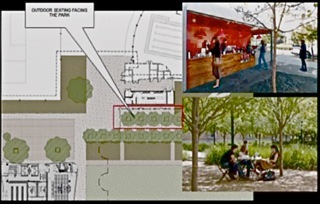 One of the nifty features of the plan, shown above, is a food concession outside the buildings, but contiguous to one of them. It is presumed this would be a coffee/take-out food dispensary. If you want to see all of the presentation, check out the streaming video on the city web site or on CMTV. The final business item on the agenda was the appointment of liaison members to two committees. 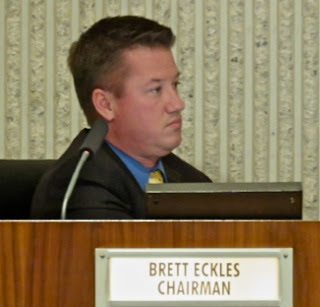 The results of that selection process resulted in Byron de Arakal retaining his role as primary liaison to the Newport Mesa Unified School District, with Chairman Brett Eckles chosen as his alternate. Bob Graham was retained as the liaison for the Fairview Park Citizen's Advisory Committee, with member Kim Pederson chosen as alternate. 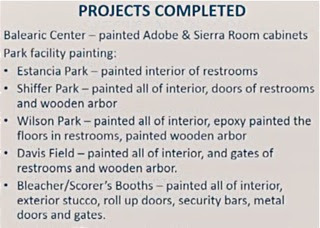 Before the selection for that committee was completed Parks Project Manager Bart Mejia was asked how long the committee will remain dormant, to which he replied "Until the Parks Master Plan is completed." That is a date-uncertain right now. 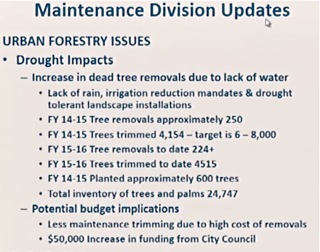 Maintenance Services Manager Bruce Hartley provided us with a lengthy description of the impact of the drought on our urban forest. He also told us of the recent accomplishments by his group, and of the pending and current projects. 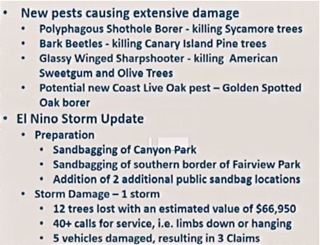 Regarding the drought, he told us that we are seeing a net loss in trees - we're losing them faster than we can replace them. 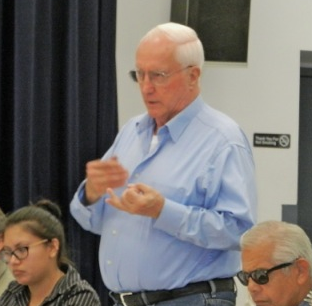 During the discussion he disclosed that there is no longer a source for reclaimed water - that their supplier prefers to dump it back into the aquifer rather than sell it for use on plants. Perhaps the most interesting part of his presentation was the disclosure of a Request For Proposals for the outsourcing most of his organization that's in the works! Right now his group is diminished from 31 positions to 21, and of those, 8 will be exempt - two people who remove graffiti and six people who will oversee the outsourced work. The remaining thirteen individuals are being, or will be, absorbed into other city positions. Hartley told me NOBODY will lose their jobs due to this outsourcing. Apparently this arrangement was negotiated with the Costa Mesa City Employee Association. During his brief Recreation Manager's Report Travis Karlen told us that he and his staff will be attending a conference in Long Beach next month at which they will receive an award for their "Ranch Program". 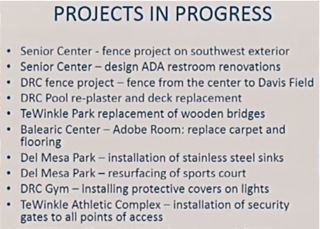 During Commissioner Comments Pederson said he was looking forward to the completion of the update of the Master Plan. He also reminded us of the opening of youth sports season this weekend - little league baseball starts Saturday and soccer begins the following weekend. Graham told us he still thought we should name the pools in Fairview Park - like the Great Lakes are named - and proceeded to present an "educational" experience for us using overhead slides showing how the Great Lakes work. de Arakal was concerned about the net loss of trees and the unavailability of grey water. He also opined that he wanted to get the Fairview Park Citizen's Advisory Committee back to work soon. 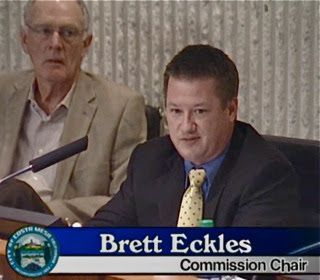 Chairman Eckles also mentioned the youth sports events and asked about including school kids in a future meeting. Recreation Manager Travis Karlen told us that there's a "Youth In Government" program in the works. The meeting ended at 8:20 p.m., adjourned until the next meeting on Thursday, March 24th. 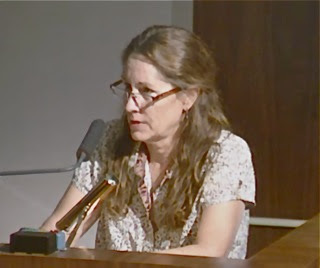 Thursday evening I received correspondence from Anna Vrska regarding the firestorm of controversy that resulted from her use of the word "Nazi", directed at the Sergeant-at-arms during Public Comments at the Planning Commission meeting on Monday, February 22nd. Even though she and I have spoken about the event and I have a clear understanding of what preciptated her use of the word, I believe her own words in the apology are sufficient, so I will not attempt to paraphrase, editorialize nor in any way modify her words as she presented them to me for publication. 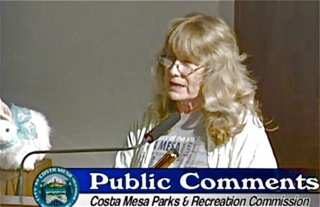 She was clear to me, though, that she did not feel she was representing the Costa Mesa First organization when she made that specific comment. As I said in my blog post about this event, HERE, it was clear to me that she had completed her Smart Growth Initiative presentation when she paused and made the comment that included that very offensive word. 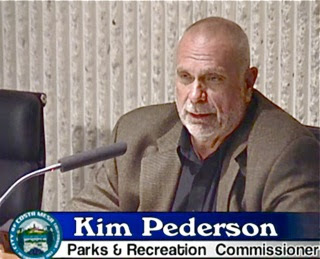 And, it was also clear when we spoke that she knows Mayor Pro Tem Jim Righeimer's plan for her expulsion from the Fairview Park Citizen's Advisory Committee is on the City Council meeting agenda for March 1st - next Tuesday. I wrote about that HERE. 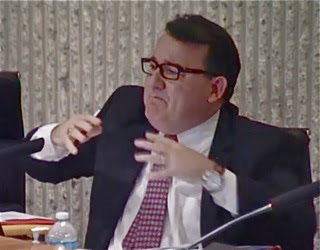 "I apologize for my poor choice of words at Monday night’s Planning Commission meeting. 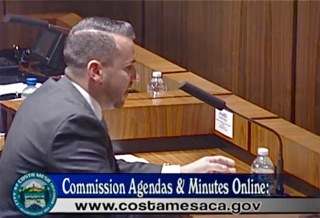 Over the past months, I have grown increasingly concerned over the continuing erosion of First Amendment rights for Costa Mesa residents. I did not intend to speak on this issue Monday night. However, an incident involving the Sergeant at Arms, and a resident, occurred right before I spoke. What I perceived to be discriminatory and intimidating behavior sparked my comment. That said, my heat of the moment reaction was disproportionate to the incident itself. As a descendant of a Holocaust survivor, and as someone whose great-grandparents perished in a concentration camp, I do not take the work “Nazi” lightly. In the context I used it Monday night, “Nazi” meant: exemplifying a person with extreme authoritarian views—and that infringement of rights, no matter how minor, in aggregate, can lead to very scary places. Though my word choice was, indeed, unfortunate, I fervently support First Amendment principles. I also support residents’ rights to express themselves and, their concerns, without fear of persecution from officials, which their comments may be directed towards. Finally, in moving forward, any disciplinary action, or retribution for speaking out, not only functions to erode speakers’ first amendment rights, it creates a chilling effect, wherein residents may not speak out, in the future, due to fear of retribution." And, finally, I must say that I agree with her final paragraph. History has shown us over the past five years that the men in charge of this city work very hard at stifling dissenting viewpoints, regardless of the forum. Her assessment is very likely accurate. 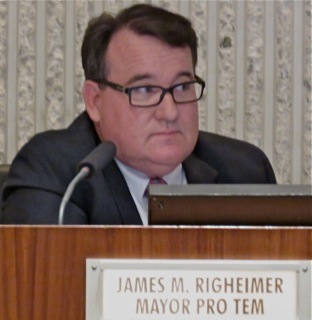 Simply the fact that Righeimer had this issue placed on the agenda will likely send shivers down the spines of folks who might wish to step to a speaker's podium and present a critical comment or an observation that is divergent with their world view. And, whether you like the word or not, it is part of her free speech protections in this country that she may say it if she wishes. The agenda for the Costa Mesa City Council meeting next Tuesday, March 1, 2016, is up and I'll post about it on a separate entry. New Business #2, HERE, is the final agenda item listed and it requires special attention. This one is a demand by Mayor Pro Tem Jim Righeimer for the removal of Anna Vrska from her position on the now-dormant Fairview Park Citizen's Advisory Committee. While this issue doesn't really require Righeimer to explain himself, I doubt he will be able to contain himself on it - expect at least 10 minutes of verbal posturing and false indignation. As specified in the staff report, the council DOES NOT need a reason to remove a person from a committee. The Council Policy, HERE, is quite specific on that subject. In that policy, under Practices and Procedures, item 2e states, "The City Council, at any time, may request the resignation of or terminate membership of any committee member." But, the timing of her removal - from a committee that has been dormant and without a Chairman for many months - is curious, at best. I watched that drama unfold - the Sergeant-at-arms responded to clapping by a woman - she seldom attends these meetings - to show support from a comment made to the commission. The officer rose from his seat in the front of the auditorium, walked to the center aisle, then up to the row where the woman sat, leaned in and told her clapping was not permitted. He then returned to his seat. This particular officer runs the meeting with a firm hand. I'm OK with that. It's a rare occurrence, though, to have an officer at a Planning Commission meeting. Regardless, he enforced his understanding of the rules of decorum, albeit with a firm hand. I'm OK with that. 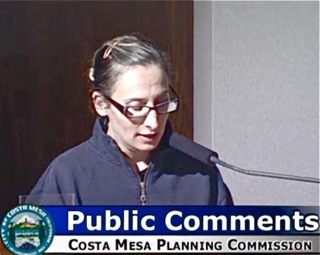 I don't know what was in Vrska's mind when, following her presentation on the Smart Growth Initiative, used the last few seconds of her three minutes to address the officer's actions and use that very offensive word. I've not spoken with her about it. However, social media has been white-hot on the subject ever since it happened. MC CARTHY - OPPONENTS ARE "HATERS"
Adding fuel to the controversial fire, Planning Commissioner Colin McCarthy launched his "commissioner comments"segment with a scathing indictment of ALL the women who spoke in favor of the Smart Growth Initiative - he calls it the no-growth initiative - with the following statement: "Nothing from me tonight except the absurdity of the no-growth hater crowd never ceases to amaze me and I guess it never will." And, he had much, more to say, as I outlined in my blog entry about the meeting, HERE. It was completely unacceptable for McCarthy to label folks simply presenting a view of the initiative as "haters". I'm convinced that his remark was precipitated by Vrska's use of the word "Nazi" just a couple minutes earlier. And, we see no sanctions being suggested for his denigration of members of the public who respectfully presented their views on the initiative - an issue he strongly opposes, by the way. And, there's more. There is very clearly a double standard being applied here. 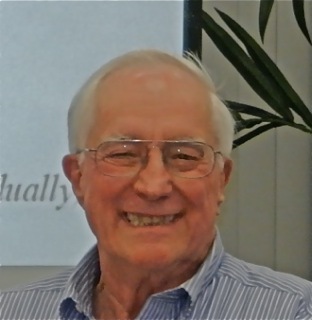 Dennis Popp, the pompous pontificator who used to operate a miserable blog in town, is also a member of the Fairview Park Citizen's Advisory Committee. During the time when it was active he took strong exception to ideas and opinions expressed by speakers before that group. 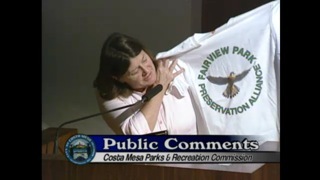 Far and away, the opinions expressed were to keep Fairview Park natural. He would frequently opine on his pathetic blog about experiences on that committee, including an entry, HERE, in which he accuses speakers of using "Nazi tactics". He used the term several times. Where was the outrage from Righeimer then? Why was he not tossed from the committee? Want more? As recently as a year ago Popp bloviated about the speakers before the committee in an entry HERE, in which he accused speakers of using "terrorist tactics", going on to compare them to "disparate groups of radical Muslims". He actually used the term "Al Qaeda approach" in his commentary. Where was the outrage then? The creation of - and the stacking of the membership - backfired on the council majority. I think they expected a huge public outpouring of support for their ideas to plow under parts of the park for playing fields, but just the opposite occurred. Overwhelmingly - estimated at 90+% - speakers demanded the park remain natural. And member Anna Vrska - a very smart, very tenacious person - was a burr under their blanket because she demanded facts - statistics to support the contention of an unmet demand for playing fields. Those numbers were never presented. 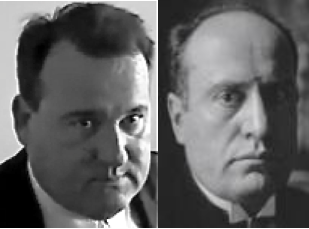 So, I fully expect Jim Righeimer - the de facto dictator in our community - will get his wish. Anna Vrska will be summarily booted from the committee for the use of a word that was unrelated to her assignment on that body. And Dennis Popp, an insider, will go unsanctioned for his despicable characterizations of folks with opposing views using the same terminology. And Colin Mc Carthy will receive not so much as a scolding for his scathing diatribe. This is what happens when the form of government deteriorates into a dictatorship - where the council majority has a stranglehold on every aspect of governance. That can all change in November. A friend shared the following recent essay from the Association for Los Angeles Deputy Sheriffs blog. It will come as no surprise to those of us in Costa Mesa, where crime was up 33% through the end of 2015, HERE. The January, 2016 numbers are better, HERE, but Burglaries and Stolen Vehicles are still off the charts. Realignment and Prop. 47 are epic failures and we, the public, are the ones who will suffer for that failure. In Costa Mesa the issue is exacerbated (not "exasperated", Steve) by the proliferation of sober living facilities in our city. 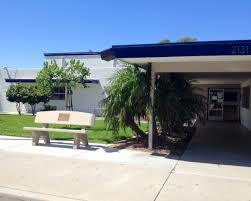 It is estimated at more than 28% of all Orange County sober living homes are in Costa Mesa. Those "clients" who run out of insurance money or cash, or otherwise fail to complete their course of rehabilitation, are summarily dumped out onto our streets, where their options are grim. In many cases it means homelessness and/or a life of crime to feed whatever their habit is. The Costa Mesa Police Department remains significantly understaffed - as I write this there are 25 open positions - even though the Human Resourcs staff and the CMPD are pushing forward with recruitment efforts with all prudent haste. We've been able to hire many of the best of the best from academy classes. Over the past four years we've lost nearly half the staff due to retirements - early and regular - and departures to other jurisdictions due to the toxic environment created by the elected leadership majority. You cannot expect the same level of performance by the new officers filling those holes in the organization that you got from those old hands who left. Police work takes experience to develop proficiency. And, because of the tension caused by the bogus lawsuit filed against the men and women of the CMPD by the Mayor and Mayor Pro Tem - combined with an unwillingness of the city to negotiate a new labor contract - it was nearly impossible to attract lateral transfers from other jurisdictions. We're told there is a new labor contract pending - after nearly two years without one - and the lawsuit continues to linger. Specialty units were decimated and positions in them were not filled, creating a disincentive to officers hoping to make a career with the CMPD. Many of the forward-thinking steps taken by previous chiefs - Roger Neth, Dave Snowden, and Tom Gazsi - have been chopped. 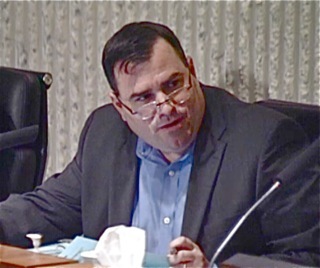 Steve Staveley tried to hold things together as Interim Chief (twice)The current city administration was non-responsive to the needs for a couple years. 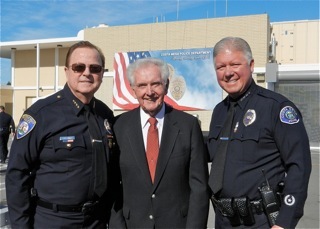 In the spring of 2014 CEO Tom Hatch received from then-chief Gazsi his plan for the resurrection of the Costa Mesa Police Department. That plan was never acknowledged, much less acted upon. The elected leadership refused to permit Gazsi and his team recruit to fill existing and anticipated vacancies for more than eight (8) months! That put them far behind the recruitment curve, where they remain today. So, this essay below is just one more exclamation point on the issues facing law enforcement throughout the state, and Costa Mesa particularly. You won't enjoy it, but you should read it. Some sycophants of the current elected "leaders" in town will say, "Well, look who wrote it! Those darn union thugs! ", or words to that effect. Well, ignore the authors if you must, even though they are the men and women who have to deal with these failed ideas every day, but read the facts. When Realignment was introduced, it was described as one of the "great experiments in American incarceration policy." Unfortunately, the guinea pigs in this experiment were not the inmates released from the state prisons, but the residents of California who lives and property were purposely put at risk. That change was followed in short order by Proposition 47, which not only led to the release of prison inmates but reduced former felony drug and theft crimes to misdemeanors. While law enforcement warned crime rates would increase if Proposition 47 passed, voters fell for an initiative duplicitously labeled "The Safe Neighborhood and Schools Act." After the passage of Proposition 47, our deputies and law enforcement across the state saw an increase in crime. Law enforcement leaders who attempted to inform the public of increase in crime due to Proposition 47 were shouted down. 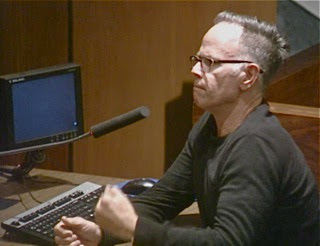 For example, when Sheriff Jim McDonnell was interviewed by the LA Times in a series of videos entitled "Thanks to Prop. 47, Californians are less safe than they were a year ago," some people claimed the Sheriff was "spreading disinformation" and such claims were "rhetoric" that was not supported by "data." Well, now we have the "data" the some claimed was missing-and it proves the point Sheriff McDonnell had been making. As detailed in a release from the Public Policy Institute of California (PPIC), a nonprofit, nonpartisan think tank, FBI statistics released last month documenting nationwide reported crime rates for cities with populations over 100,000 for January-June, 2015 showed California suffered a drastic increase in crime rates in both the violent and property categories. In the violent crime category, California had 3 cities in the top 5, and 5 of the top 10, for increases in violent crime rates. The grim news didn't stop with the "top 10." 49 of 66 California cities in the report had increases in violent crime rates; 34 of those cities saw the violent crime rate increase by double digits. It was even worse in the property crime category. California took the first 3 spots for increases in property crime rates, and 5 of the first 10. 48 of the 66 California cities saw an increase in their property crime rates, with 24 seeing the rate rise by double digits. In a blog by the Public Policy Institute of California, the authors noted the property crime rate increase was "widespread and not trivial in magnitude." Of particular note, wrote the PPIC, was that that large cities in the next four largest states (Florida, Texas, New York and Illinois) saw decreases in property crime. 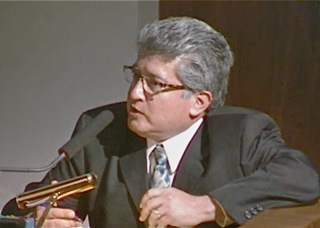 The Association for Los Angeles Deputy Sheriffs (ALADS) is the collective bargaining agent and represents more than 8,200 deputy sheriffs and district attorney investigators working in Los Angeles County. To contact the directors, click here.